Topics discuss include: How to raise start up capital. Seasonal marketing ideas. What to do when your largest client leaves? What’s better to use, postcards or brochures? How to build your customer base with referrals? Gain one customer then lose one customer. How to stop it? How to pre-qualify customers when they call? How to bid jobs. What should you include in a commercial lawn care bid? What newspaper ads work best? How to buy a lawn care business. Tips on buying used lawn care equipment. And much more.. Anyone can start a lawn care business but most get stuck finding customers and they give up their new venture too quickly. 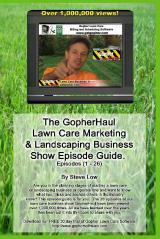 Why struggle trying to learn how to gain new lawn care customers the hard way? 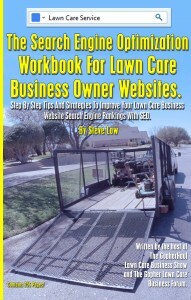 This book gives you lawn care marketing ideas that are being used by your competitors. It also talks about what marketing ideas don’t work. New lawn care business owners were polled and 33% of them said the toughest part about running their business was finding customers. 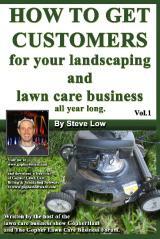 This book shows you how to get new lawn care customers. Don’t start from scratch and try to re-create the wheel. Learn what works and what doesn’t. 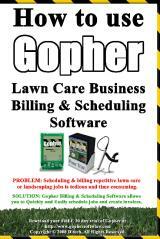 If you ever had thought about starting your own lawn care or landscaping business but weren’t sure how to go about putting together a business plan, this book will show you examples of lawn care business plans created on the Gopher Lawn Care Business Forum. 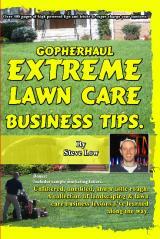 The author of this lawn care business book is the host of The GopherHaul Lawn Care Business Show and the Gopher Lawn Care Business Forum. When you are a teenager you have a lot of rebellious energy. Why not take that energy, harness it to be productive, and make money! 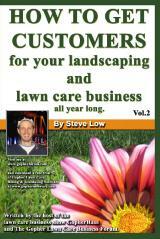 This book will show you how to succeed in starting your own landscaping & lawn care business. I cover the basics of how to register your business to advanced topics like incentives to get employees to sell more. Packed with 268 pages of useful information.